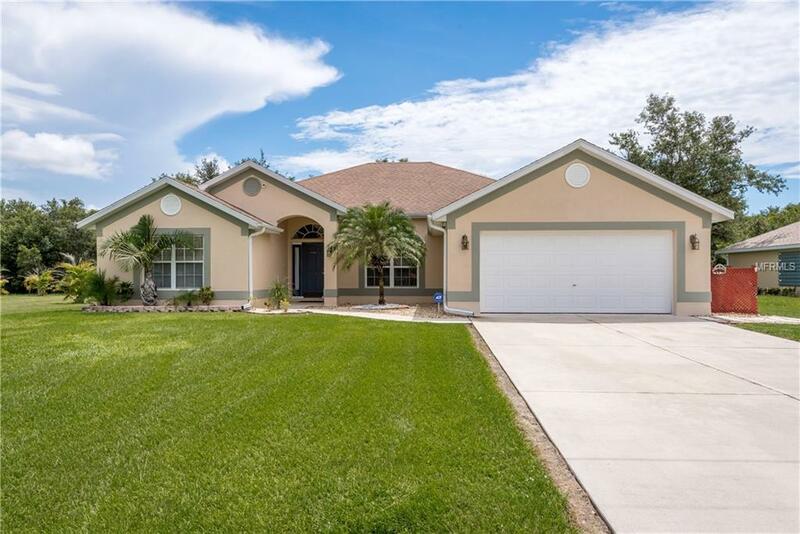 SECLUDED 4 Bed/2 Bath/2 Car garage POOL HOME on a CUL-DE-SACE street in desirable Deed Restricted Deep Creek. Home is located in a very well maintained, quiet neighborhood surrounded by nature with plenty of privacy. This property is extremely spacious offering an AIRY OPEN FLOOR-PLAN with split bedrooms, great for family and entertaining. Interior features include volume ceilings, foyer medallion, durable tile throughout, stainless appliances, bonus office/den area, french doors, oversized laundry room, and many other upgrades. The master features ease access to the lanai, dual sinks, garden tub with separate shower stall and a spacious walk-in closet. The guest wing of the home offers 3 full bedrooms and guest bath with easy access to the main living room. Float in your heated pool with a cool beverage while overlooking nature. Other exterior features include a beautiful front elevation, and mature landscape. Situated between two brand new homes. Enjoy the nearby community playground with tennis courts and the Deep Creek Golf Course a couple of miles down the road. Youll love the convenience to I-75, restaurants, grocery stores, Wal-Mart, etc..all of which are just minutes away.